Did you know that on almost every day of the year, at least one member of the New York Yankee's all-time roster celebrates a birthday? The posts of the Pinstripe Birthday Blog celebrate those birthdays and offer personal recollections, career highlights, and trivia questions that will bring back memories and test your knowledge of the storied history of the Bronx Bombers. Which Yankees were born in October? When I first started following Yankee baseball in 1960, the stolen base was something other teams did but not my Bronx Bombers. The Yankees had built and sustained a dynastic offense on slugging power and in the early ’60’s if somebody stole a base who was wearing a pinstriped uniform, it was either by accident or Mickey Mantle’s legs were feeling particularly strong that day. Case in point, in 1961, the Yankees led all of baseball with 240 home runs and also trailed all of baseball with just 28 stolen bases. It was the Chicago White Sox at the time, who lived and breathed by a small ball attack that depended on stolen bases to spark their offense it was their great shortstop, Luis Aparicio, who provided the lighter fluid. Little Louie had made his Windy City debut in 1956 and proceeded to win nine straight AL stolen base crowns. That’s why it was pretty shocking when today’s Pinstripe Birthday Celebrant stopped Aparicio’s streak in 1965, by stealing 51 bases for the A’s in just his second big league season. If you ask Jim Kaat, the one-time Yankee pitcher and game announcer, who Campaneris reminded him of, it might have been Mantle instead of Aparicio. “Kitty” was the first big league pitcher to face the 22-year-old Cuban in his rookie season of 1964 and Campy hit Kaat’s first pitch to him for a home run. He then homered off Kaat again in the same game. This incredibly talented shortstop brought an immediate element of excitement to a Kansas City team that had played horrible baseball for a very long time and gradually, he helped mold that ball club into a force that would win three consecutive World Championships. He would capture six AL stolen base titles in his first eight seasons. Then, just to prove he wasn’t a one-dimensional player, he decided to try and hit home runs during the 1970 season and hit 22 of them. Campy’s career with the A’s ended after the 1976 season. The bitter Oakland owner Charley Finley had thrown up his hands at free agency and was cashing in his chips by unloading all of the team’s best players. Campaneris was one of the few A’s stars left from the three straight world championship teams to make it to free agency before being traded. He more than doubled his last A’s salary when he signed with Texas. But he was 35 years-old at the time and his best days were behind him. Over the next five seasons, he evolved into a utility infielder and pinch-runner first with the Rangers and then with the Angels. It looked as if his big league playing days were over for good when the Angels let him go and he played the 1982 season in Mexico. The 1982 Yankee season had been a nightmare. The team finished in fifth place, below five-hundred and had gone through three managers. George Steinbrenner brought Billy Martin back to manage the 1983 club. When the Boss signed Reggie Jackson as a free agent after the 1976 season, Martin had wanted him to sign Campaneris instead. Campy contacted the Yankees about coming to spring training because he had heard they had a shortage of infielders. He was invited to camp and got a break when Roy Smalley went down with appendicitis. Though he didn’t go north with the team he did accept a roster spot with Columbus instead and was called up to the Bronx in early May. He ended up doing a better-than-decent job as Martin’s key infield reserve. He hit .322 in 60 games of action and even stole 6 bases, leaving him with a career total of 649. It was a fitting end to an outstanding 19-year career. 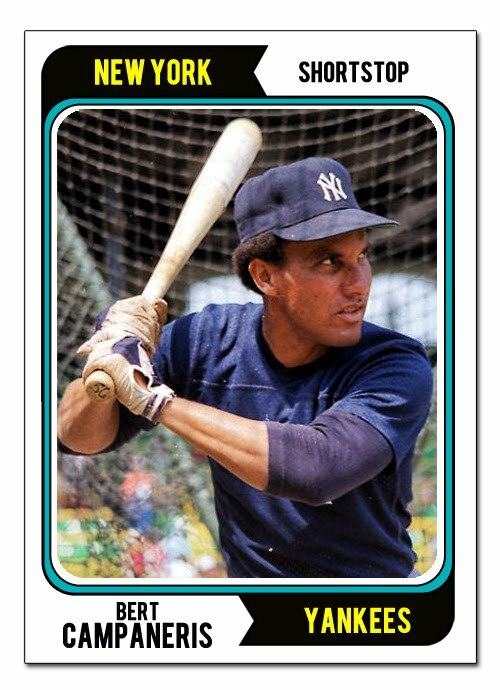 Campy shares his March 9th birthday with this Yankee who hit one of the most famous home runs in franchise history, this sidearming southpaw, this former Yankee outfielder and this former AL MVP. All rights reserved. No post or part of a post in this blog may be reproduced or transmitted in any form or by any means, electronic or mechanical, including photo copy, recording or any information storage and retrieval system, without permission in writing from the author.